If you could form an image of yourself from the inside out, what do you think it would look like? Do you see a strong, fearless picture of someone ready to take on the world, or do see someone weak and fearful, shying away from all that comes before you. I have to be honest, if you would ask me this question a few years ago, I would probably go for the weak guy in the back of the room scared of everything around him. With that in mind, have you ever tried to picture yourself in Christ? In other words, the image that you would get when looking at yourself through the character of Christ. When looking at the lives of most children of God, I cannot help and see something different than the image that the Bible gives us. Don't understand me wrong, I'm not judging anyone, but merely stating that we as children of God, need a fresh understanding of the character of Christ. The image that I see here, is a victorious one of a King, bold and fearlessly wonderful. This image however comes in conflict, with the way that we as children of God sometimes see ourselves. It's my opinion that the main reason for our low self images is because of the lack of knowing the truth about Christ's character in us. Looking at the explanation of the armor, I see some characteristics of Christ as seen in Revelations 19. The thing that's apparent however about the armor, is that it has to be applied by the one whom seeks it. 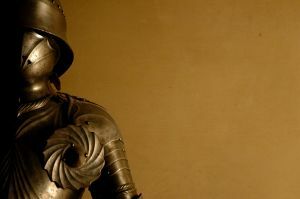 The Modern King James version says that we have to take the armor to ourselves, thus giving us the responsibility to take up the characteristics that is revealed in Ephesians 6. The truth about our character in Christ as I see it, is the enactment of our relationship with Christ in this world, thus taking up His character, and transforming our everyday lives. There is nothing passive about being a child of God! All that God wants for us, has to be taken up by us as His children and made part of our being. Think about David coming up against Goliath in 1 Samuel 17. David did not try to take on this giant without any experience or resources, he took the truth of God's character and provision as he experienced it in the fields taking care of sheep. He was in other words living the relationship that he had experienced tending the sheep in his fathers field. The size of Goliath was no matter, but rather the truth in the heart of the warrior that had to beat the giant. There is however one thing that we have to know before venturing out into this world as victorious warriors through the character of Christ in us. This truth is locked up in verse 18 of Ephesians 6, we read "Pray at all times in the Spirit, with all prayer and entreaty..."
It's in prayer that we get to know God and experience his provision through His Spirit. Our prayer room can be seen as the armory, where we take up Christ's character(armor) to be able to walk out into the world equipped and ready to defeat the giants, proclaiming victory and freedom to all that is lost. Recall your picture from earlier, ask yourself, have you taken up the character of Christ in your relationship with Him?